This a detail of our Arc de Triomf (L'arc de Triomphe - The Arch of Triumph) which I had ignored in my pictures so far, maybe because obvious things in the city sometimes are overlooked by its inhabitants. 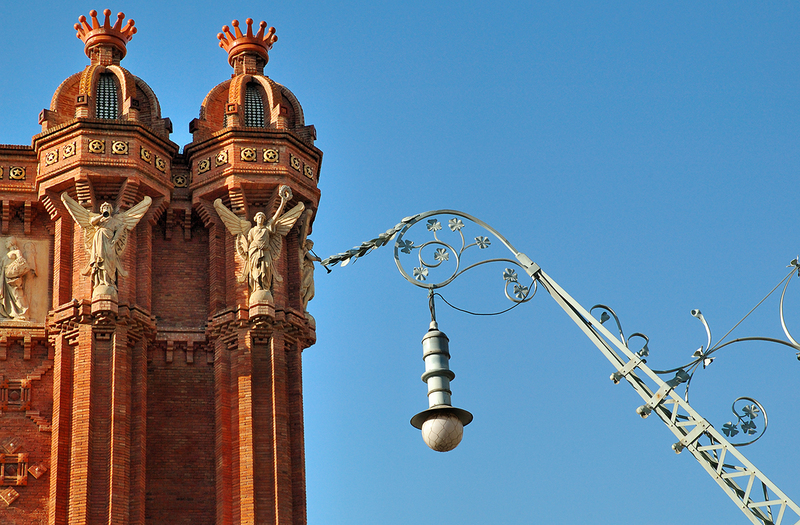 Next to the monument and all along Passeig de Lluis Companys you have these wonderful Catalan Art Nouveau street lamps. Built during the 1888 Universal Exhibition by architect Josep Vilaseca i Casanovas, the arch was the main entrance to the venues. As you can see it is made of bricks and is an important representative of the Moorish revival style. Check my google map below to find the exact place in Barcelona. I like this kind of picture full of contrast. A really good construction, a nice shot. Good to see your photos for a long time! And you can find still new wonderful objects to photograph in your city! It`s so rich of wonderful things. Have a good beginning week! Congratulations on an intriguing photograph - I particularly enjoy such architectural images. As a member of the trivago community, I've added a link to your blog as I'm convinced our visitors would find it just as interesting as I do. Keep up the good work! Leena, I will check this new site of yours. Pierrej, I checked the link to Trivago and I liked it very much so I will link you back. I am pleased you added my site to your community.